As a teenager, I listened to my parents. 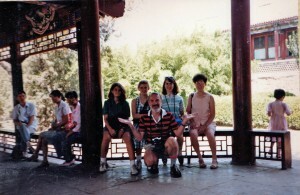 Before I flew off to China via Canada in 1988, they insisted I take slide film. Slides, they said, would be perfect for a place like China. 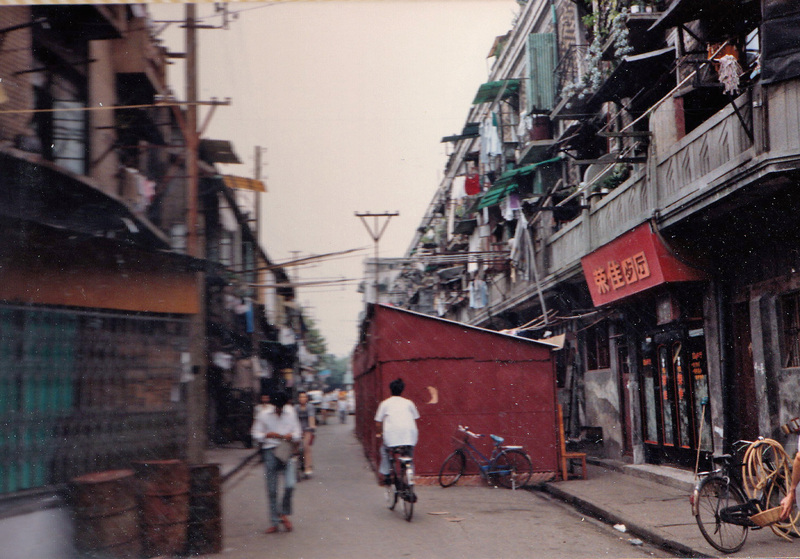 Ancient architecture, fascinating street scenes, an altogether different way of life than what I was used to. It’s not surprising that I haven’t seen those slides in 25 years. But I’ve often thought about my lost images. Thanks to my friend Megan, I now have photos from that trip. (She was smart and used a Kodak disc camera.) We met yesterday, caught up, rehashed the trip with our tour leader, Mary (also a close family friend to both of us). It almost felt like I was back in China with them. 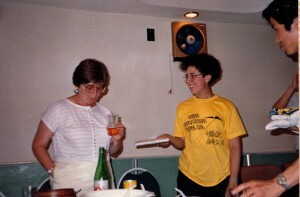 Our first dinner in Beijing in June 1988. I’m 17 years old and sitting here with Lloyd, the only male student on our trip. 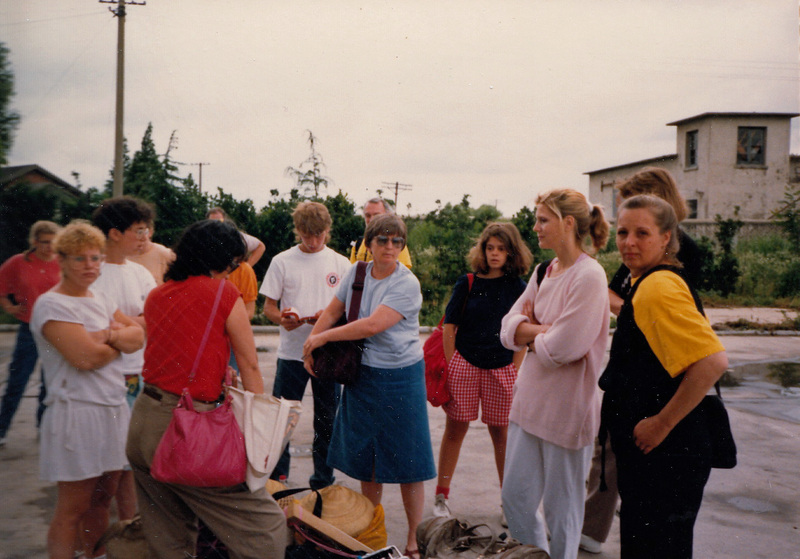 Because it was my high school’s first trip to China, Mary scrambled to find enough people to make the tour happen. We had seven students and nine adults. 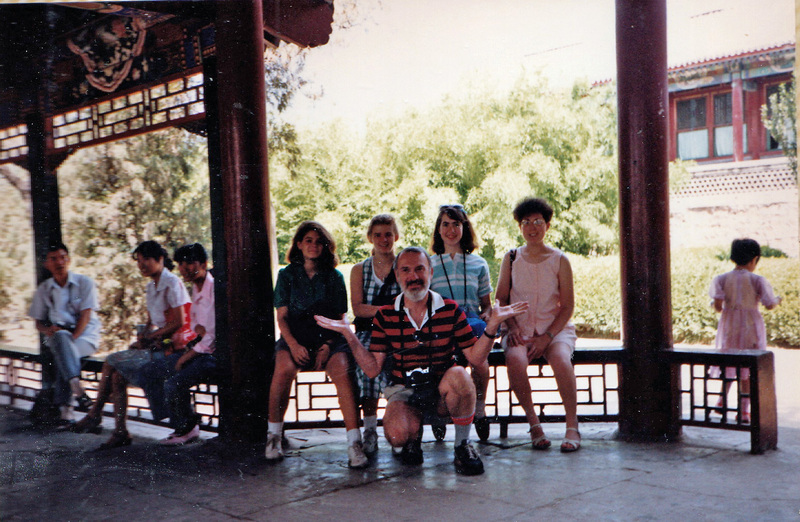 Here are some of us at the Summer Palace in Beijing. And a Beijing street scene. Next stop: Nanjing. 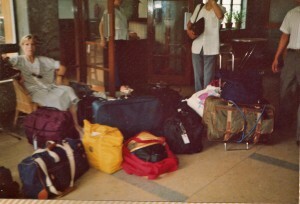 We stayed here the longest. 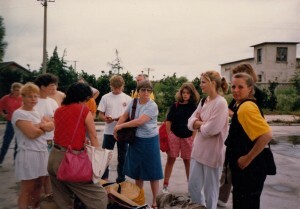 Our plane landed at the wrong airport in Nanjing, so we waited around for several hours while Mary connected with our tour guide. This was years before cell phones. 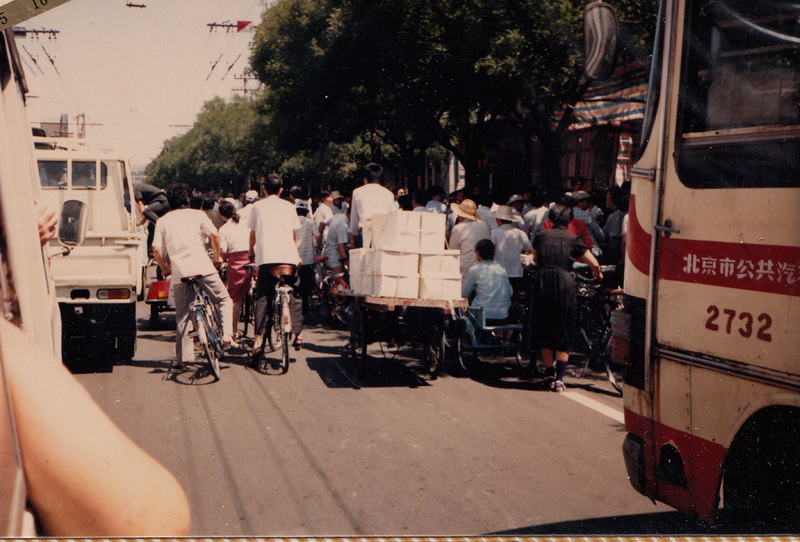 I would return a few years later to spend a week with our guide, Mr. Chen, and his family. Chen worked at the Nanjing College of Fine Arts, where on that first trip we viewed this calligraphy demonstration. Ever the geeky tourist, I’m wearing my tour group shirt (with coordinating yellow pants!) and have my camera fashionably hung around my neck. 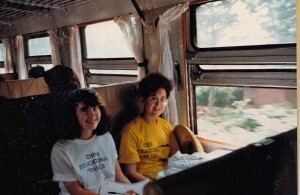 We rode the train from Nanjing to Wuxi. Touristy conical hat: check. Tour t-shirt: check. Huge 80s hair and glasses: mais oui. 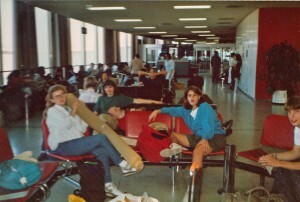 Our group was as shoestring as it could get back in 1988. We stayed in one run-down Soviet style “sports” hotel in Beijing, but the rest of the time we slept in dormitories (Nanjing, Wuxi, Suzhou, and even Shanghai). One evening we met a local student who went by the English name of Star Victor. Here we are talking to her. I must have been writing something in this photo. After Wuxi, we stayed in Suzhou for a couple nights. 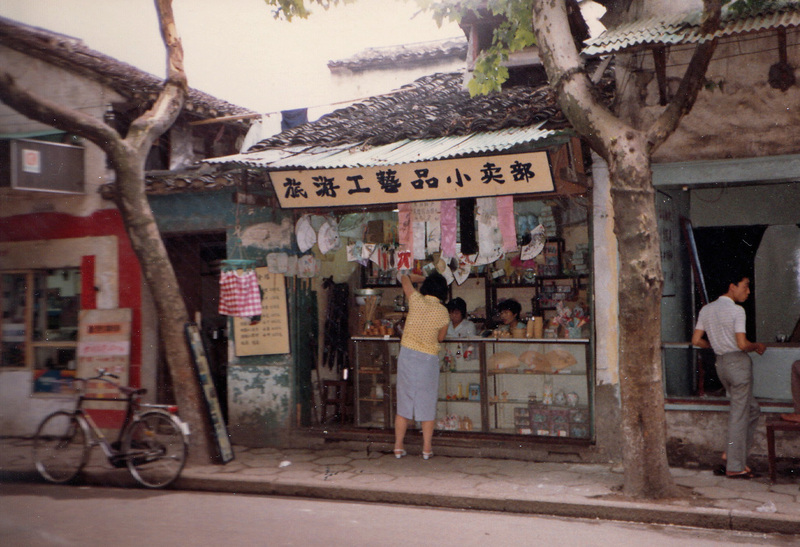 Here’s a cute store that’s probably long gone. Our final destination was Shanghai, where we stayed at the Shanghai Conservatory of Music’s international student dorm. I would honeymoon at the same dorm seven years later. 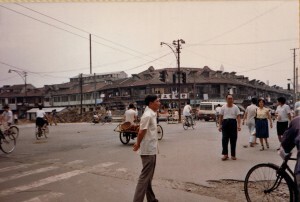 This is what Shanghai looked like back then. Near the former adult amusement center, New World, which was promptly closed in 1949. After dinner, back at the Conservatory, we danced Chinese style, ie, same gender dance partners. 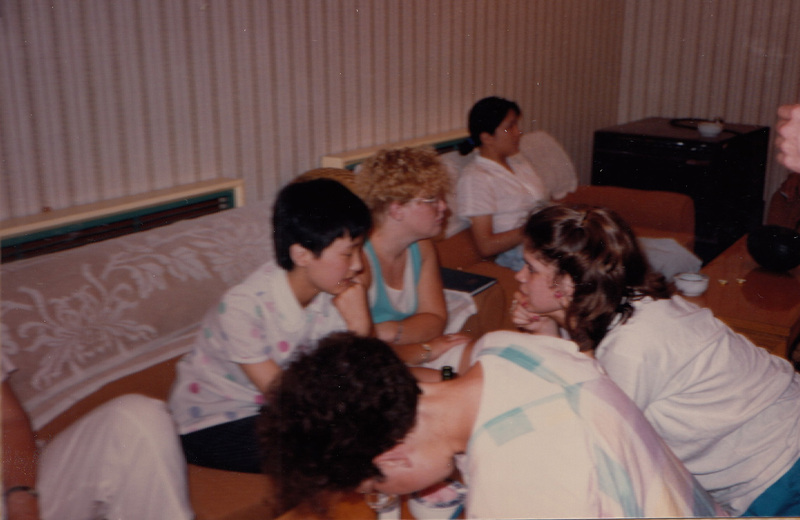 Waiting to leave the Conservatory’s international dorm on our last day in China. 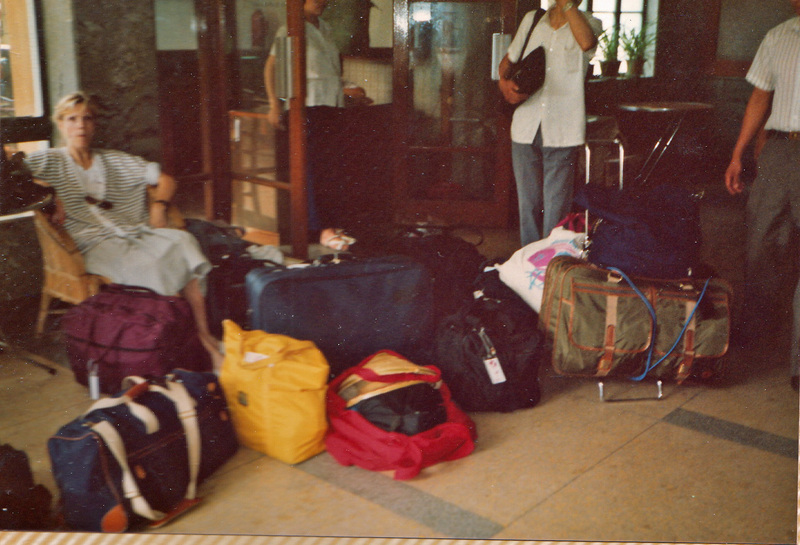 This was a pretty popular backpacker stop back in the 80s and 90s. 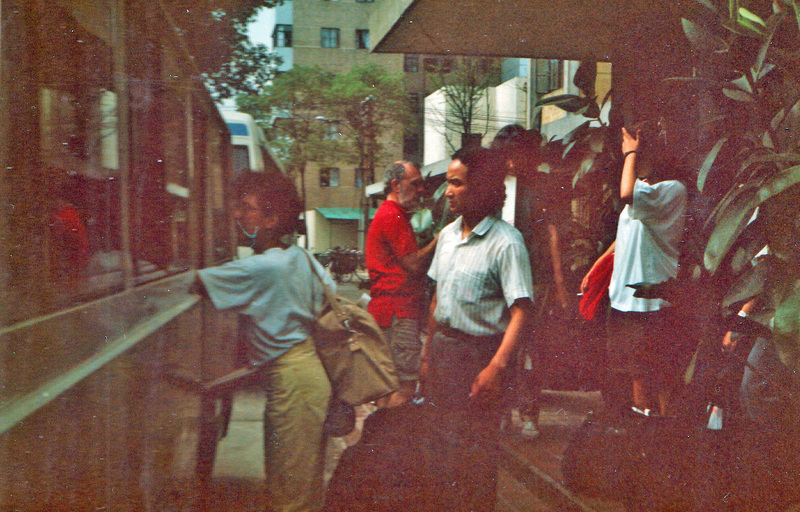 Here I’m boarding the bus from the Conservatory (where my ex-husband now works) to the airport. 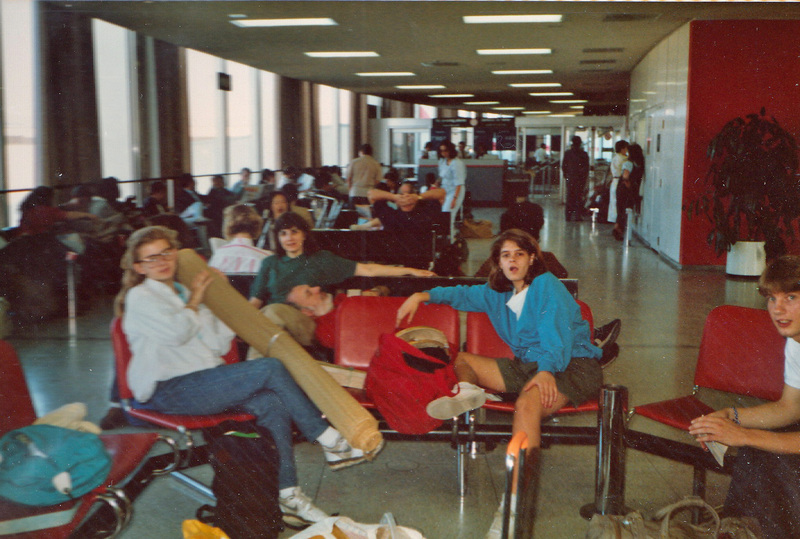 To add a note of sadness, the man in the red shirt and the man in the white shirt standing behind me have both passed away since this photo was taken. 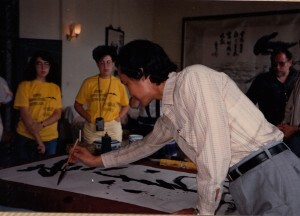 Another of our young guides in Beijing also died years ago. 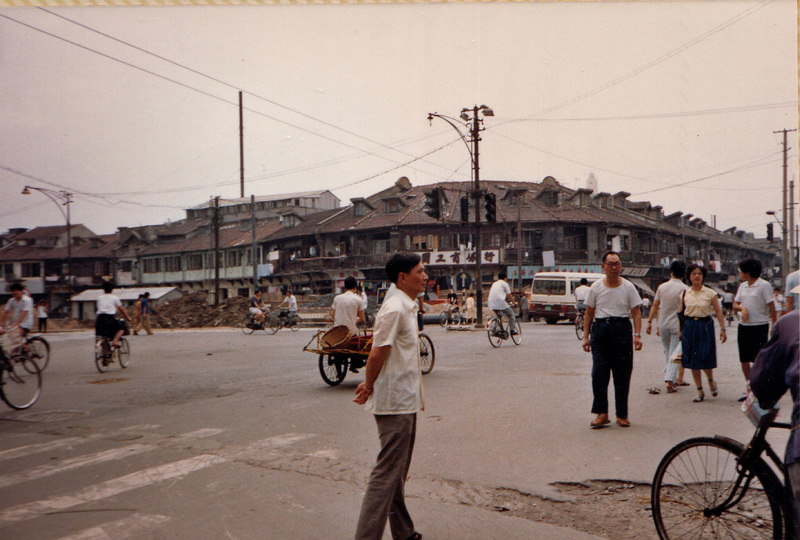 And here’s the group at the old Hongqiao Airport. I also bought one of those bamboo sleeping mats (which I’d grow to despise after I actually had to use one several summers later). 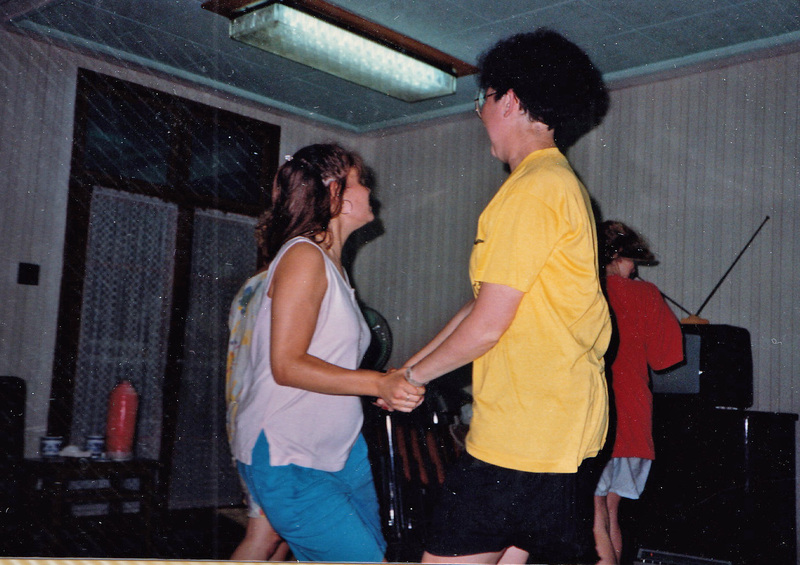 Megan gave me more than 100 photos to scan, but these are just a handful or two. It really does seem like a lifetime ago. 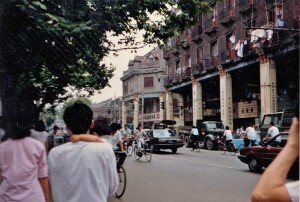 I was born in Shanghai in 1988 and came to the states one year later. 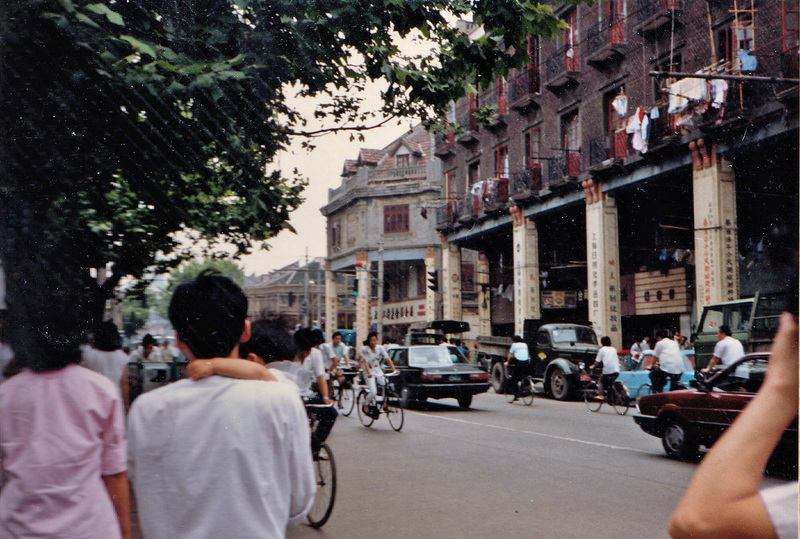 It’s really interesting to see what Shanghai (and China) looked like the year I was born, thank you for that! Thank you so much! Wow, that’s wild that you were born in Shanghai the year I first went there. I’m glad I could provide some photos from that year. OMG, these are fascinating! I’m such a lurker on your blog. I love going down memory lane with you; it’s very nostalgic. I first came to China in 2005, which really wasn’t the long ago in the scheme of things, but sometimes it’s unbelievable how much has changed, how much I have changed. You must feel the same. It is almost bittersweet. Please post more photos from this trip if you have the chance! They are so interesting. Thank you so much! I’m so honored you like the blog and will definitely post more photos from that trip. You’ve seen China change over the last decade, which is pretty huge. I haven’t been back to mainland China since I left Asia in 1998, so I’m kind of scared to see what it looks like now. Of course, I wouldn’t turn down a trip to go back, though! Thank you again! I do hope that you washed that yellow shirt as regularly as you wore it…. Well, I’m not sure we had laundry facilities apart from our bathroom sinks. 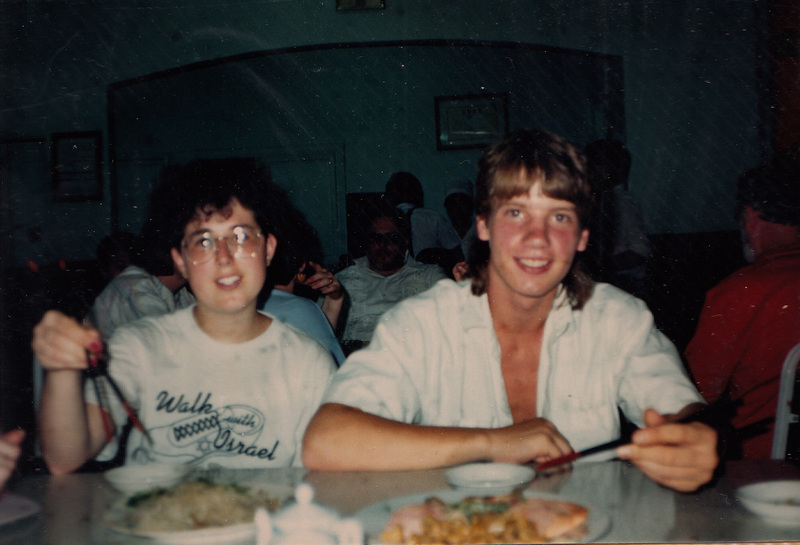 It was June and pretty humid, so I hate to think about what was going on with that back then! Thanks for your comment!